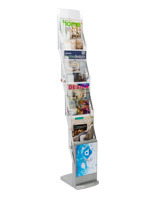 This pop up magazine stand is a portable brochure and literature holder that is sure to look great in a wide variety of locations. 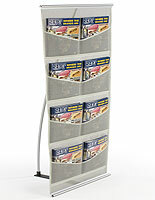 Such racks are essential trade shows tools for disseminating pamphlets and other important info. 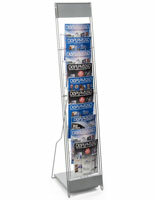 Each lightweight magazine stand is completely portable, even coming with a carrying case for transporting. 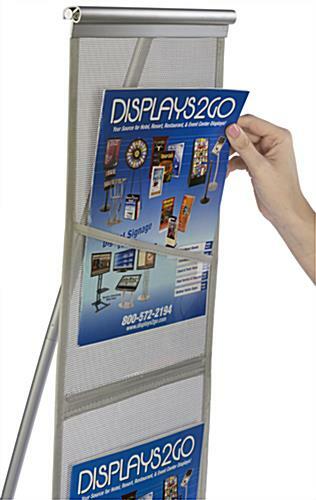 After each trade show, simply detach the unit’s base and roll the clear plastic front before placing the entire fixture in the carrying bag. 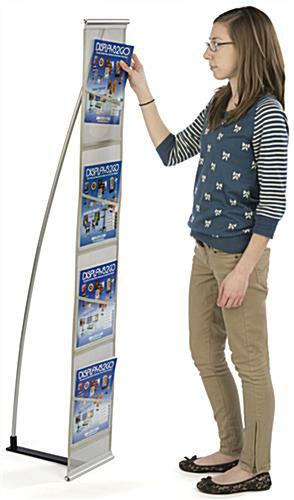 This magazine stand has (4) 8.5” x 11” brochure and literature pockets. 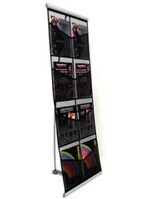 As an added convenience, these racks features slip resistant metal footing. 10.0" x 58.5" x 20.0"
Received product and was very happy. Very easy to assemble and transport. I will probably acquire a few more after checking this one out as a test. 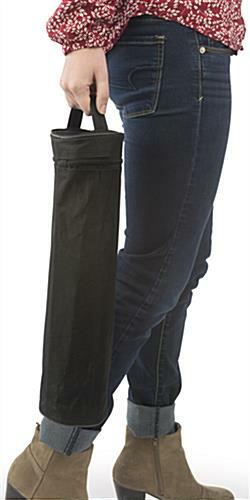 Works very well for trade shows and it is very light weight to haul around. Thank you so much for taking the time to write this excellent review, Eli! 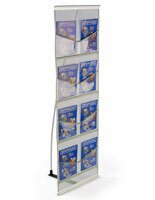 We're thrilled that you're using our literature stand at trade shows, and found it to be easy to set up and transport. 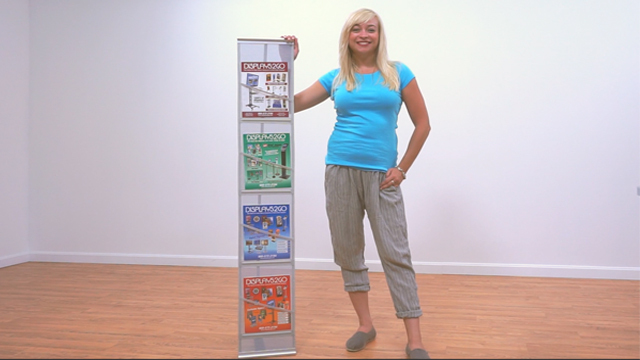 We hope you'll continue to turn to Displays2go for your trade show needs! Needed replacement - No problem! I had placed an original order and one of the items came damaged. I reached out to customer service and within a day I had a replacement sent to me. The item is exactly as I needed and is of sturdy quality. I have placed a number of orders from this company and each one has been delivered on time if not early. All prices are reasonable and some of the best on the web. Customer service is easy to deal with and offers a pleasant experience. Will definitely continue to order from this company. Thank you for excellent service! 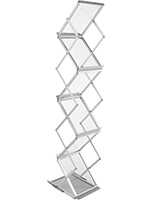 4 Pocket Floor Stand - WILL BUY AGAIN! I ordered these to travel with our trade show team. I read many reviews and am thrilled with the product we received. 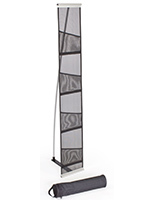 These stands are not only easy to assemble but high-quality products that will stand to travel. The only thing we noticed is the pockets are a little snug for more than a few pieces of point of sale. After using many other solutions, that would break during shipping or tip during the show, we started using this one and have had amazing results. I have already recommended to other colleagues. 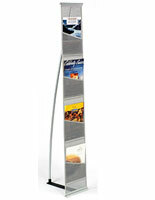 The pockets were too small to fit more than two of our brochures. There was not any instructions that came with the stand on how to set it up. The silicon packets had been ripped open so when I opened the package the little silicon balls went all over my office and I keep finding them all over the place weeks later. I ended up returning it. Hi Lindsay, We're so sorry to hear about the trouble with the packaging. We've forwarded your feedback to our team of customer care specialists and someone will reach out to you to assist. Thank you for your patience.